Win “My Book Club Only Reads Wine Labels” Tote! 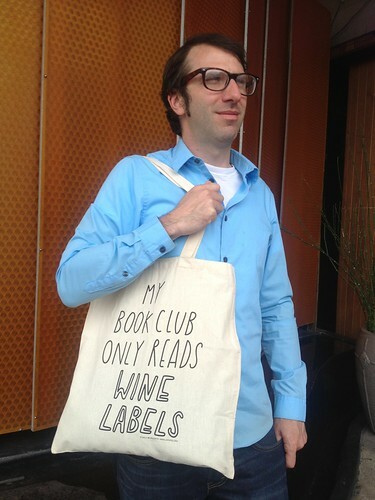 I came across this “My Book Club Only Reads Wine Labels” tote on the internets thanks to my friend Sarah. I decided to post about it, and it turned into one of my most popular posts. So on a lark, I decided to contact the creator of this funny-because-it’s-true catch phrase, Sally Beerworth. I wanted to buy a tote to then give away to one lucky reader and asked her where I could purchase one in the States. Sally offered to mail me one free to use as a giveaway. Sweet! If you are curious to see what else Sally has dreamed up, leisurely peruse her website called “The Joy of Ex Foundation.” She also has a book called “Updating Under the Influence” you can check out on Amazon. But back to the tote. How do you win the dang thing? Easy! Just add a comment to this post with a book recommendation. Because books are the only things I like reading more than wine labels. Don’t agree with all of it, but thought provoking… It’ll get the gears turning! What better reading material for a wine…er, BOOK club than books that refer heavily to food and drink? I love this tote. One of my favorite book club books ever was The Amazing Adventures of Kavalier and Clay by Michael Chabon. Read Cloud Atlas by David Mitchell. It is a wonderul genre hopping creative work. (There is a movie made about it too I hear that is coming out in October) But it is a must read for fiction. If I were to ever be in a book club, the book I would want to share would be Brideshead Revisited by Evelyn Waugh. Not Waugh’s funniest book, but a lot to talk about. Or Garlic and Sapphires by Ruth Reichl. Because she’s a badass. Art of Racing in the Rain. Hotel on the Corner of Bitter and Sweet. I absolutely adore The Night Circus by Erin Morgenstern. I haven’t been transported to a different world through a book like that in eons. It definitely bumped something off my Top 10 list. Hilarious! I love the tote! So I’m currently in the midddle of “High Performance Web Sites.” I must say, it’s a thrill a minute. Maybe a better recommendation would be Omnivore’s Dilemma by Michael Pollan. Awesome tote! I would have to recommend My Horizontal Life by Chelsea Handler, its Hilarious! I literally laugh out loud…sometimes in public.. The Canterbury Tales (Geoffrey Chaucer). I had to read this in high school literature class and as much as I disliked the class, I still think about the book and the class discussions that followed. I would love to revisit the book as an adult; while enjoing a glass of wine. Bet he likes “bubbles” too, with like, potato chips. In my book club we totes only read wine labels. & Novels. But I find while tipsy it is better to read short stories, so I’m recommending ‘If I loved you, I would tell you this’ by Robin Black. I enjoyed this collection immensely. A fresh take on the deep emotional wounds of our lives (I may reread it now since I’m currently going through the toughest emotional wound ever in my life). I adored each of the stories in the collection (some much much more than others) but the titular story, The Guide, Pine and Tableau Vivant hit me hardest. Such beautiful, painful stories in the vein of local favorite Raymond Carver. If you haven’t read Raymond Carver’s short stories yet I’d definitely recommend those as well over a bottle of wine. Start with ‘What we talk about when we talk about love’ and then read ‘Cathedral’. Let’s drink more pink soon. That tote bag speaks truth – must have. I found Gabrielle Hamilton’s “Blood, Bones & Butter – The Inadvertent Education of a Reluctant Chef” hard to put down. And pastry chef David Lebovitz’s “The Sweet Life in Paris” an interesting read on expat life (plus recipes!). I’ve always thought this tote was so clever! Our book club just finished a self published work called Wool Omnibus, and it was quite great. Post-apocalyptic and weird but in a new fresh way. A “wine book” seems appropriate – Napa, by James Conaway, which is one of those rare non-fiction books that reads like a novel. And then there’s Sideways, of course, which is a novel that reads like a non-fiction book. It’s hard not to reach for a glass of wine while reading those books. As for non-wine books, my favorite of all time is A Confederacy of Dunces, by John Kennedy Toole. In addition to being a hysterical novel, the story of how that book eventually came to be published is tragically intriguing. Two great story recipe books… One old: Cross Creek Cookery by Marjorie Kinnan Rawlings and one new: Cooking for Mr. Latte by Amanda Hesser. Love!! Some favorite fiction this summer: ‘Beautiful Ruins’ by Jess Walter… it’s Italy by the sea in 1962, Old Hollywood, New Hollywood, post-Grunge. Truly fantastic. ‘Gone Girl’ was worth the hype and a total page-turner. ‘The Family Fang’ just came out in paperback; a truly fun read about a family of performance artists and the lines between life and performance, and the negotiating of life and art and the in between. Humorous, memoir-ish essays: ‘Let’s Pretend This Never Happened’ by the super-funny Chris Gethard. And if you like graphic novels Michael Kupperman’s ‘The Autobiography of Mark Twain 1910-1920’. Just superb. And hilarious. Sorry… “A Bad Idea I’m About to Do” was Chris Gethard’s book… ‘Let’s Pretend This Never Happened’ is by Jenny Lawson. The former is a tighter read, I think, but both are very entertaining. Sarah Silverman’s ‘Bedwetter’ comes highly recommended. Also, ‘Still Life with Woodpecker’ by Tom Robbins. “Being Wrong: Adventures in the Margin of Error” by Kathryn Schulz (check out her TED talks, one about being wrong, the other about regret). Game Change for interesting behind the scenes politics. Bijaboji: North to Alaska by Oar – autobiography of a young adventurous woman ahead of her time who rows her beloved canoe from Anacortes to Alaska. I love it but am seriously biased. Glad my work amuses you guys. Currently in the middle of Bel Canto. Excellent so far! Not sure if I gave you the name of the book I was reading in Santorini, but it was The Wines of Greece, by Konstantinos Lazarakis. Really though, I totally want that tote! If I don’t win it I am going to have to make my own bootleg copy. J, I recommend going back to an oldy and reading “Cannery Row” by Steinbeck. You won’t be disappointed. (now, fingers crossed that I win the tote). I love The Wind-Up Bird Chronicle by Haruki Murakami. Just re-reading it now. I’m with Mary. I’m going to have to make a copy of that tote if I don’t win! Alice Waters and Chez Panisse: The Romantic, Impractical, Often Eccentric, Ultimately Brilliant Making of a Food Revolution. Very cool…… reading Younger Next Year for Women ….. gotta have this bag! I would be using it daily from my home with a wine cellar to my job at a wine agency…..
Love Love Love this tote. And what would a book club be without wine to begin with. Ah yah! excellent! so cool…. I want one! Reading the Secret Daughter ….. highly recommend it. My serious comment is “The Tipping Point” by Malcolm Gladwell, but the book that makes me laugh no matter what is “Hippos Go Berserk” by Sandra Boynton. Sometimes you just need a children’s book! Love the bag, Current book favorites American Diet, $100 Startup and Linchpin. I have been loving The Everlasting Meal by Tamar Adler. 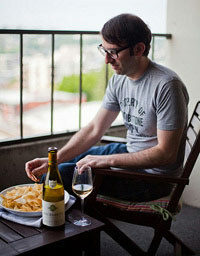 Good food, good wine, good tote bag, what more could you want? Kill Your Friends – John Niven….or if that aint yo thang, The Thought Gang – Tibor Fischer. Now where’s my frickin’ tote? Thanks for the recos but the contest ended Friday. The world of blogging is a fast-paced one! Maybe I’ll bring one down to Chile; it’s easy to pack.